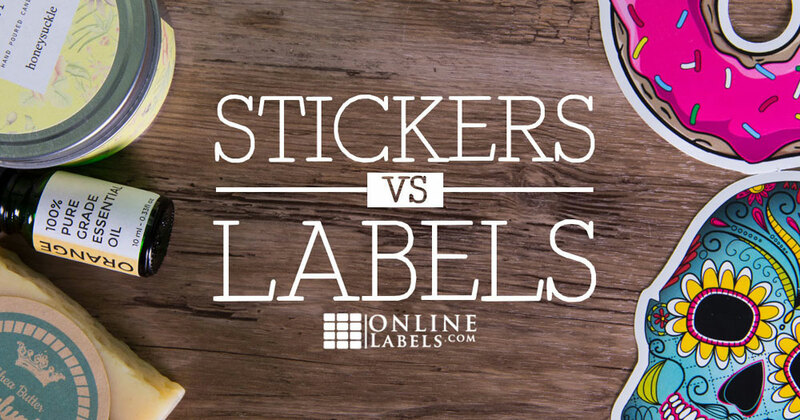 Home › Label Learning Center › Industry Trends › Stickers vs. Labels – What's the Difference? The two terms, "sticker" and "label," are a bit paradoxical. They're so similar yet they have distinct differences. Can they be used interchangeably? While there's no right or wrong answer, it doesn't hurt to dispel any confusion. Let's explore accepted definitions, similarities and differences, and examples to help you differentiate each word and product. Then, keep reading for instructions on how to make your own. How do you think of stickers? Review the information below and see if it aligns with your perception of stickers or labels. 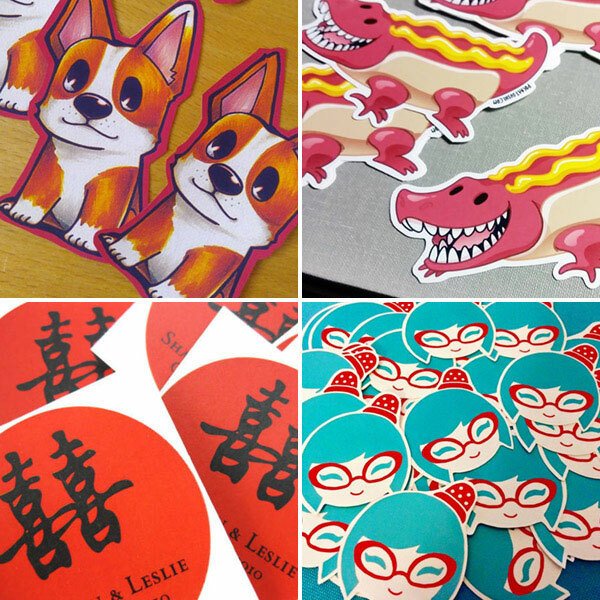 From left to right, stickers by puppySHAKER!, Pocket Sushi, Manyi Au, and Jaicy Scarpitta. 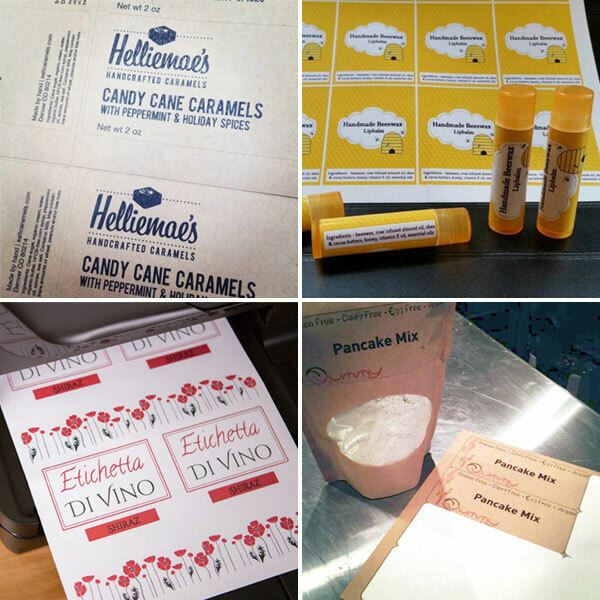 This process works best with electronic cutting machines like the Silhouette Cameo, Cricut Explore, and Brother Scan N Cut. Pick your sticker paper sheet size. If you're doing this by hand, you may want to opt for a liner with back slits. Browse all full sheet options. Select a sticker paper material. Start designing in your cutting machine's design software. Print your design. Follow these printing tips for best results. Adjust your machine to match the sticker paper cut settings. Load your printed sheet into your machine and get to cutting. Hand out as you see fit. Read through the information below to see if your view of labels matches up with the dictionary definitions or popular uses. Dictionary.com A slip of paper, cloth, or other material, marked or inscribed, for attachment to something to indicate its manufacturer, nature, ownership, destination, etc. From left to right, labels by Ellen Daehnick, Danielle Centuallas, OnlineLabels.com, and Taylor Petrehn. Pick your desired label shape and size. Use our free blank or pre-designed templates in Maestro Label Designer to create your design. Print your design. Read through our printing tips before getting started. Peel and apply when you're ready. Are the terms "sticker" and "label" interchangeable? While incredibly similar, labels and stickers do have their differences. Whichever you're looking to create, we're happy to help. Reach out to our customer service team if you have any questions throughout the process or visit our Label Learning Center for more expert tips.